Jack says this coal-burning steam train engine is a Canadian National Road Switcher. 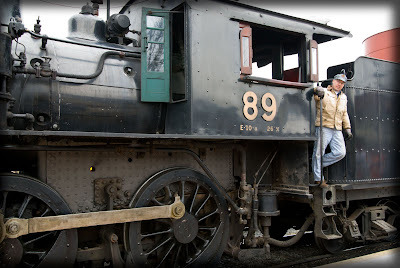 I took this picture at the Strasburg Railroad in Strasburg, Pennsylvania, this afternoon because I've signed up for another class at BetterPhoto.com, and I needed some pictures. This time I'm learning (well, I'm trying to learn) how to shoot photographs in RAW format. The engineer was hanging off the train chatting with folks as I was angling to get a good shot of the engine. It wasn't until I uploaded the pictures at home that I saw he was looking in my direction. I have been wondering about RAW. Do you need special software to edit it? Love this photo. I remember the train whistles blowing when we visitied Grandma and Grandpa in Lodgepole... still a sound that I love. well I am not suer what you were trying to accomplish, but it looks good to my untrained eye! Don't you love learning something new!? I SO wish I took better photo's. Learn, learn, learn, then YOU teach me a few tricks in May, please.